Pickled garlic scapes! Delicious but not well known. 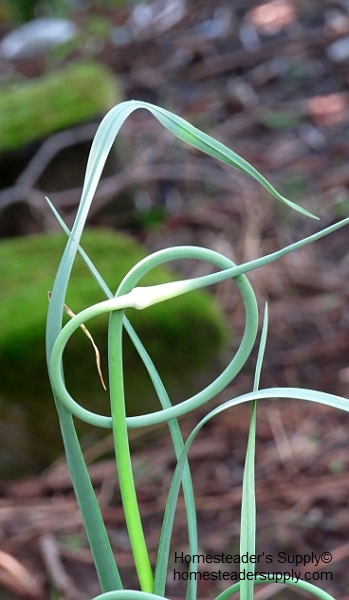 Scapes are the flower stems of garlic. Whether you should leave them on the plant or cut them is up to the grower. We like to pickle them. If you love garlic you’ll most likely love scapes, too. They are garlic’s bonus. Pick scapes while they are young. I wait until they start to curl so that I have more scape to eat, and pick before the lower portion of the stem starts to get woody and tough. I put my canning jars in the dishwasher and go out to pick scapes. The jars will still be hot when I’m ready for them. Coil the scapes to make putting them in jars easier. This works well for small mouth jars. Fill the jars to one-half inch from the top. Mix well and bring to a boil. While you’re waiting for the boil add two to three teaspoons of pickling spice to each pint jar. Pour boiling liquid over scapes, filling jar to one-half inch from the top. Wiggle the jars to remove all air bubbles. Apply lid and screw on ring until it’s finger tight. Finger tight means snug but not so tight that air can’t escape. Place a rack in the canner and fill canner with hot water (around 180 degrees) high enough to cover the jars with one inch of water. Bring the water to a full rolling boil, cover the canner and reduce heat to bring the boil down to a light but steady boil for ten minutes. Remove jars from water and place them on a cooling rack out of the breeze. Listen for pops. Each pop indicates a jar has sealed. Re-process jars that don’t seal or place them in the refrigerator and eat them first. Waiting approximately six weeks to open the first jar makes for the best pickled scapes but that’s not easy to do. I open the first one after a month. They’re not quite there yet but they’re definitely delicious enough to enjoy! This entry was posted in Canning, Preserving, Recipes and tagged recipe on July 8, 2014 by Homesteader's Supply. These sound great, I think I’ll make a batch. Though I’ll probably do a half gallon jar and just stick them in the fridge so I don’t have to heat up the house with a canning pot. It works well. I don’t hot water bath my cucumber pickles and never have a jar’s seal break. Also, your comment above – regarding not water bath canning. Could you expand on that? Or is there a post somewhere? How are you doing it and still getting a seal that is shelf-stable and doesn’t require refrigeration? I’m curious because I do water bath my pickles, but they always end up soft and soggy and there’s not enough refrigerator space to do them all that way. Thanks so much for the post and the new idea!! I had the same problem with my pickles – soggy and soft. Ick. I bring the vinegar and water to a boil and pour it over the cucumbers and other ingredients, wipe the rim to be sure it’s dry, and close them up. The pickles I have left from last summer are still crisp. 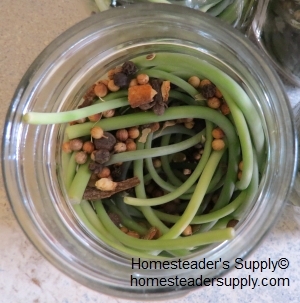 I’ve added another blog on garlic scapes that should be helpful!